I’ve wanted to try this little mix of cooking and science for awhile now, so with Friday being a half day for Maddy, I thought it was the perfect time. If people really knew how much of an ice-cream family we are–how many half-gallons of ice-cream we keep in our freezer at any given time–they’d know that this New For Us Friday was crazy exciting for us. Who cares if it’s the middle of the winter? We eat this sweet treat any time of the year! 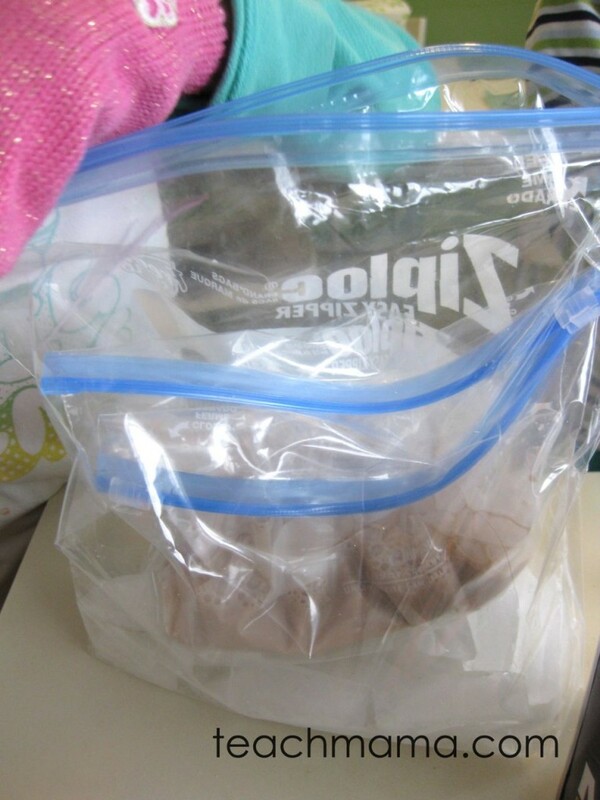 Easy, Homemade Plastic Bag Ice-cream: Dozens of recipes exist online for Ziploc Bag Ice-cream, but I did a little searching and found one that seemed to repeat the most and decided to try that one first. 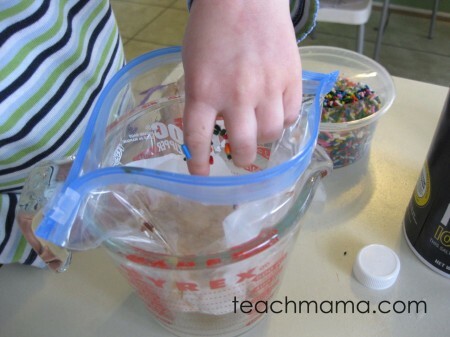 Our plastic bag icecream recipe is here to download if you’re up for trying it out. 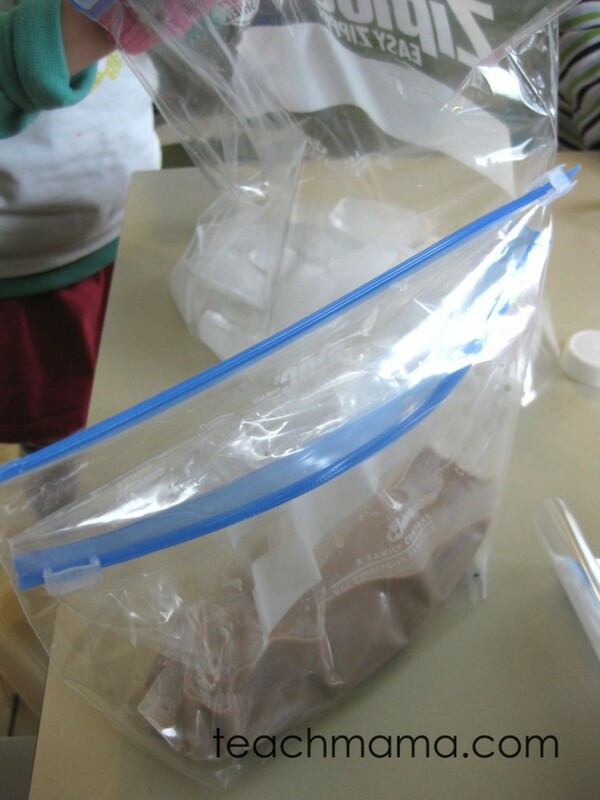 Really, Plasatic Bag Ice-cream is just that–ice-cream made in a plastic bag. We used Ziploc Bags so the bags would really stay shut. 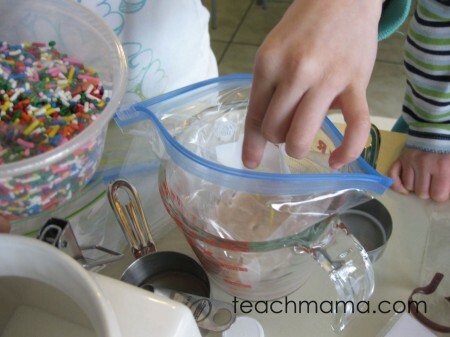 Plastic Bag Ice-cream takes a few ingredients and a lot of shaking, and I was totally pumped to try it. In the morning, as we walked Maddy to school, I said to everyone, So we’re going to try something new today. Guess what we’re going to make when Maddy gets home from school? She has a half day, so we need to do some celebrating. Cora said, Muffins! Yeah! I love muffins! 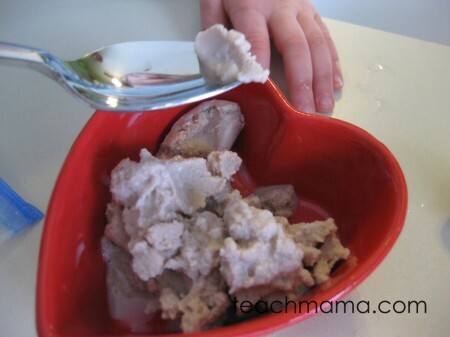 I said, We all love muffins, but this treat is super cold and creamy. 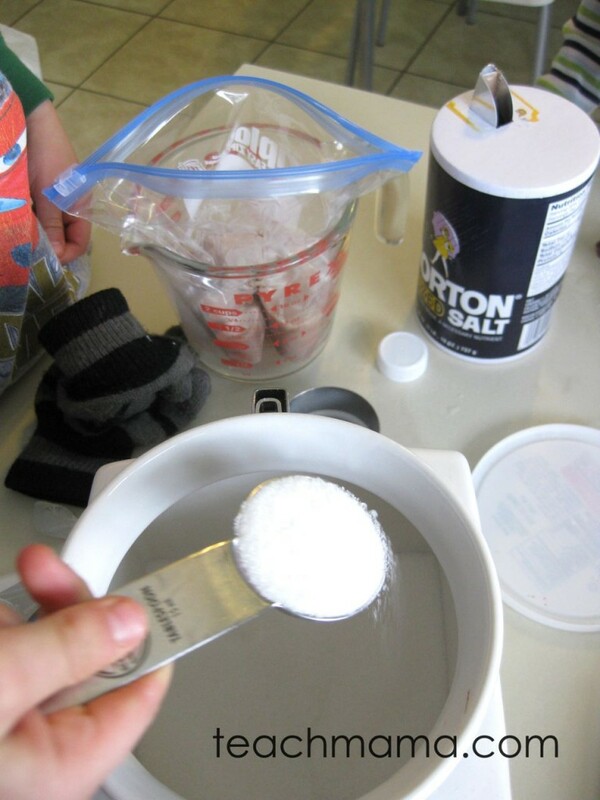 Owen guessed ice-cream immediately, and I said, Yep–we’re making ice-cream. 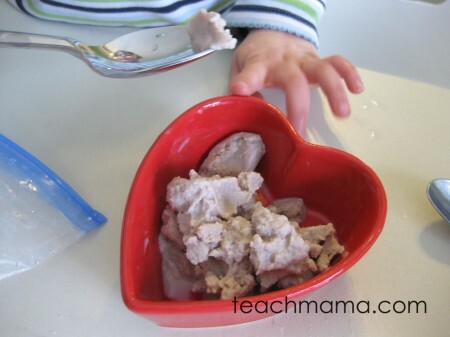 But this will be a crazy recipe because we need mittens and music to make it. Why do you think we need mittens and music to make ice-cream? Because it’s cold! Soo, so cold! Owen screamed. No one could guess why we needed music, so I said they’d find out later–and they did. Later, when I yelled, Okay, everyone grab a pair of mittens and meet me in the kitchen! I heard three kiddos running at me, mittens in hand. Because everything I read suggested no doubling of the recipe, Maddy started us off. 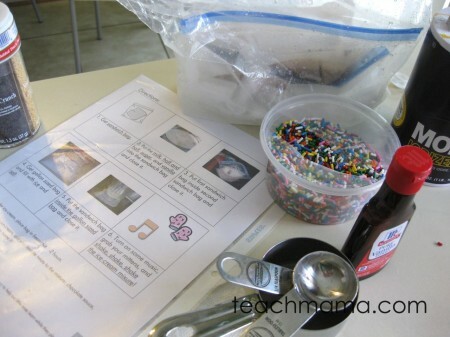 We read the plastic bag icecream recipe and assembled all of the ingredients. Maddy placed her first sandwich bag in a measuring cup to keep it sturdy. She poured in the wet ingredients, sealed the bag, and placed it into the second sandwich bag. Then she added ice and salt to the gallon-sized Ziploc bag, put on her mittens, and headed for the living room where the music was blasting. She jumped, shook, and wiggled her little body until Owen and Cora joined her with their finished bags. Everyone shook, jiggled, and tossed our bags of ice until the ice melted and our hands were tired.
. . . Owen sports his gloves and is ready to shake! Because Owen and Cora’s were still pretty soft, we threw theirs in the freezer to harden a bit, but Maddy’s ice-cream seemed ready to go. I split hers into three bowls, grabbed some spoons, and Y-U-M! It worked! Sure, it wasn’t as sweet as the stuff we buy, but it was cold, creamy, and sweet enough. And we made it ourselves. 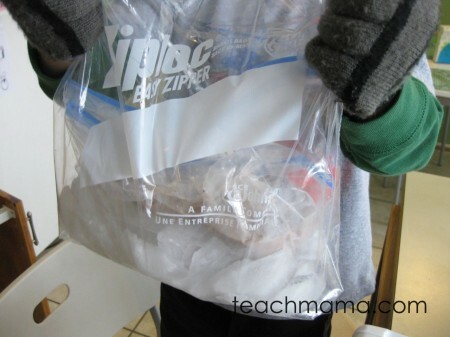 what made the ice melt in the bag? how did the milk and half-and-half become so cold? what did we add that made the ice-cream sweet? what did they like about their homemade ice-cream, and what would they do differently next time? Everyone said it was great, but Maddy–even though we used chocolate milk and added sprinkles to the mix–said she’d like hers to be sweeter next time: I think it needs another tablespoon of sugar, Mom. I’d like mine sweeter. Hmmmmmm, wonder where this chica pequina gets her sweet tooth? Super cool NFUF at our house! 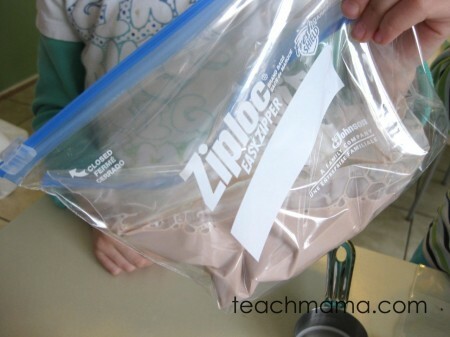 And thanks a ton to Mama Feelgood who all the way back in July recommended that we try Ziploc Ice-cream. Finally, we got to it, and I’m glad we did. We’re always looking forward to trying new things around here, so hit me with your ideas! 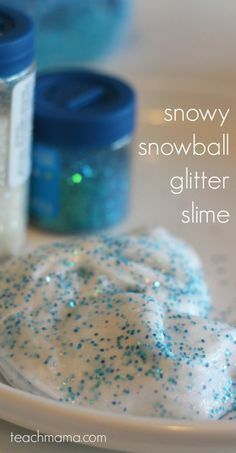 Need some more super-cool, totally fun ideas to get you through the winter? 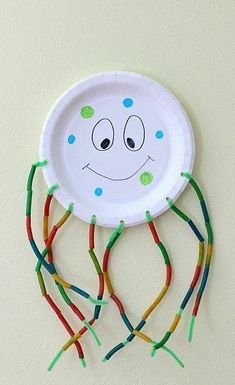 Check out our Cooking with Kids board or Cool & Creative Indoor Fun board on pinterest! 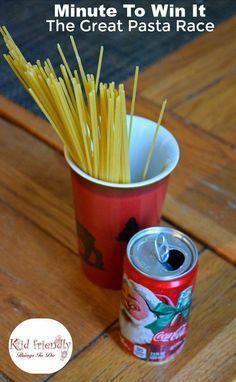 Have any other cool ideas for us to try? We’d love to hear ’em! 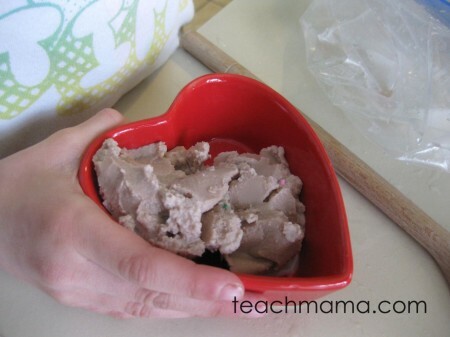 new for us friday: homemade dog treats! I can’t easily download this recipe. We loved this last year! Can you upload to scribd? Much easier there. thanks so much. Love your blog! yes, yes, yes! Sorry, Whitney–sloooowly but surely transferring everything to Scribd! thanks for reading, my friend!! I would LOVE to make this for my birthday! 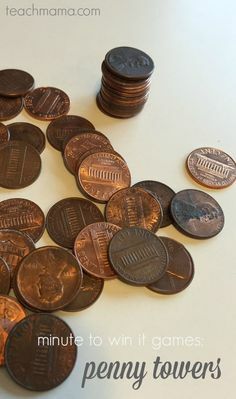 Will it work if I double or even triple this recipe? Krista–try a smaller batch first, friend! Then? GET CRAZY!